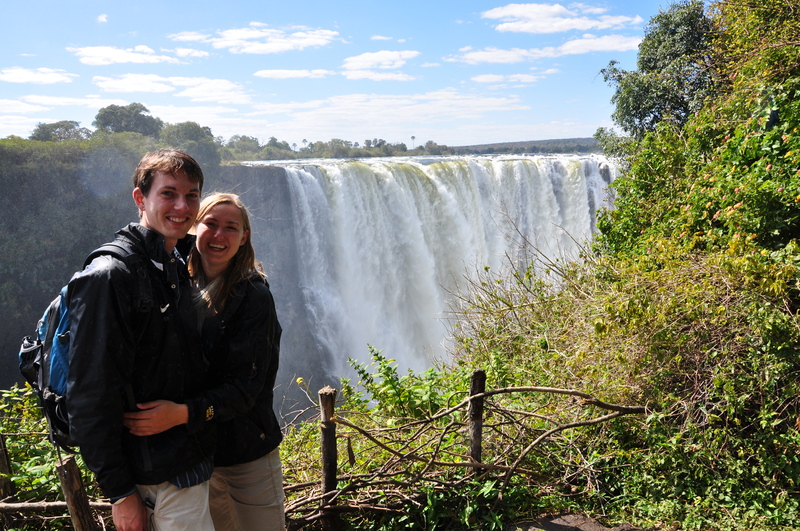 Since we have such a backlog of days to catch up on our blog we will make this post a reference to help catch up on our journey from Johannesburg to Victoria Falls and then back down through Botswana. Got up and had hot showers, which felt amazing after two days of travel. On a fact sheet in the bathrooms it stated that Victoria Falls Backpackers does breakfast, but when we went to check out the situation there was no one cooking or eating. We had to walk through town on our way to Victoria Falls, so we decided that we would stop there for breakfast. I was first awoke at 1 am with a sudden stop and lurch by the train and find myself in the unusual position of sleeping on my stomach, while I find both of my hands are gripping the top corners of the mattress. I turn over in order to fall back asleep and am awakened again later in the morning, but am able to fall back asleep without a problem. The ladies who Alisa sat next to had politely enquired about our travel plans and had told her of a hotel around the corner from where we were dropped off. We stopped in and the rates were 40 and 60 USD and we both decided that this was out of our price range, and that desperation had not set in and we would continue to search. We saw a large, nearly immaculate white building across the street and as the sun was making it’s way down the face of the building we figured this would be a safe, but also warm place to set our stuff down and make our next move. Alisa looked up the location of the information centre’s location and fortunately it was just next door across an empty parking lot. We sat and waited, while watching people on their way to work, and we received few stares, even though we were had a mass of our bags and ourselves in a very viewable location from the road. A police officer came by, said hello, and asked if we were looking for the sun. I was a bit confused at first, but then he completed his thought by noting that it was very cold and I replied in the affirmative that we were waiting for the sun. He passed on by and I thought it was a good sign that we had a proper police officer nearby. Even though the police have a poor track record in Zim, the vibe he gave off didn’t cause me any worry. However, as we sat there and did not move along soon after, he swept by again and forcefully, but professionally, told us that ‘we don’t allow people to sit here’. We apologized, picked up our stuff and started to move towards the information building. Luckily there were steel park benches just nearby and we were able to move there and drop our stuff once more and we waited quietly until Information opened. I wasn’t expecting much, but when a well dressed young black woman showed up exactly at 0830, I thought we might actually be at a proper tourist office. We waited five minutes then picked up our stuff (remember Alisa has a massive backpackers backpack, about 3/4 as tall as she is, with her normal size backpack on her front, while I have my backpack, my large adidas sports duffel, and a Woolworths cold bag) once again and moved into the office. We found a well kept inside office with lots of brochures and asked about where we should go for breakfast and as she was giving us ideas, an older white Zimbabwean came into the conversation and told us about Indaba, a local cafe, and a few others that were around the block. We told her about our journey and she gave us a quick run down of things to see in the area, with a local market just next door, the Art Museum, the Natural History, and then gave us directions to the Train Station for us to get our tickets. We inquired about if they knew of a place where we could drop all of our bags, and they told us they we could leave them right here! I was quite surprised and very glad luck had smiled on us, as this made the biggest difference in our day. We dropped our bags, expressed our thanks and went our with our task of getting tickets. First we stopped at Indaba, an exquisitely decorated ‘reading cafe’. We were given a large Southern African wildlife book upon being seated along with our menus and saw on the menu that they had a library of books as well as new books for sale. We had a classic South African breakfast (sausage, rashes of bacon, eggs, tomato, and mushrooms, of which of course I ate Alisa’s discarded tomato and mushrooms). We also found WiFi in the place, and even though it was only a 15 minute ‘preview’ we were ecstatic to find it and be able to let send out quick emails and update our Twitter feed. We ate, browsed the library, admired the artwork on the wall (all made by local artists, and all for sale) but then set off into the warming Bulawayo morning and trekked across the city to the train station. I was surprised how clean the city was, and then noticed how many rubbish bins there were on street corners. I thought this must be the first time I have seen bins for rubbish on city streets outside of South Africa, but even in SA they are mainly places for advertisements, however in Bulawayo they were bright yellow, with black print encouraging citizens to “Keep Bulawayo Clean”. The streets were extremely wide, each major thoroughfare separated by a divider that had large green street light arches that looked like they were from 1950s’ California. I was very impressed. We eventually got to the train station, the 20 minute walk stretching our legs that had been on the bus for 15 hours, and getting to see the city. It felt extremely safe compared to what I was bracing for. 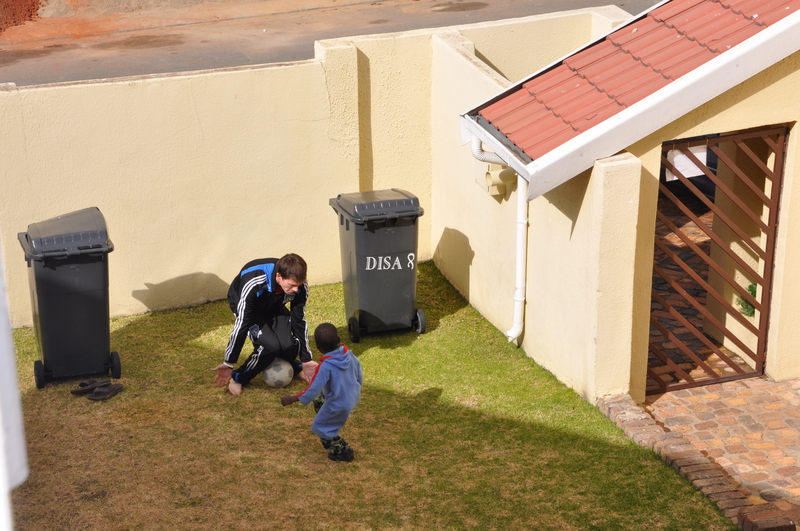 We received less stares than in SA, and many random ‘hellos’ or ‘howzits’. And none were from street vendors, they were just from people standing or walking on the city streets. 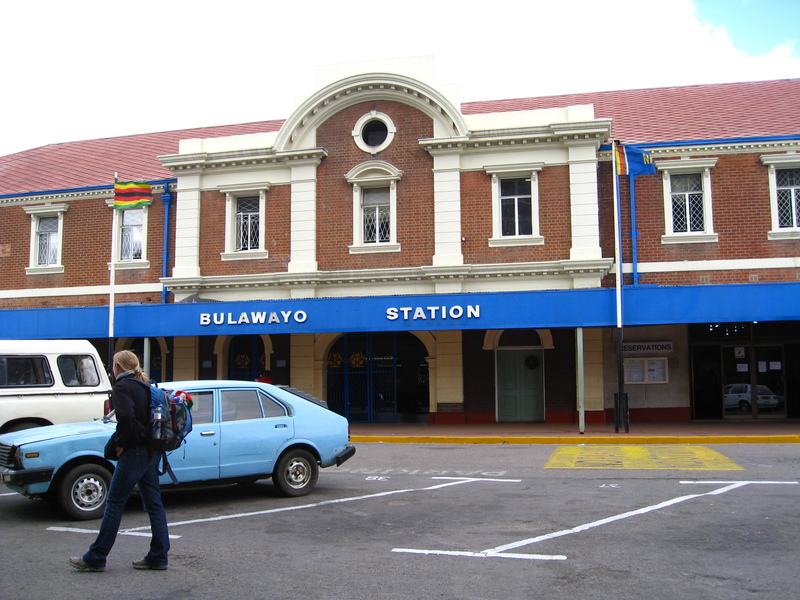 We make it to the Bulawayo station, and find the place to purchase our tickets where we are told that all first class compartments are sold out. This worries me a little because every place we had read said there were always some available, and that you should always take first class. Instead we bought two second class tickets, and then were asked whether we wanted to be together or separate. Alisa somehow realized that we needed to buy another bunk in order to have our own compartment, so we bought another USD7 ticket to have it to ourselves. We again encountered a skewed exchange rate when we tried to pay in Rands, but only payed R158, instead of the expected R210 (doing conversions is not anyone’s favorite thing in Bulawayo, and you usually end up with rates that make no sense in relation to each currency, but we found that most use the simple 10 to 1 ratio). We had asked at Information what currency came out of the ATMs and were told that it would be United States Dollars. However, on our two attempts to find a working ATM on the way to the train station we encountered darkened screens, and security guards and tellers who could not direct us to a working ATM. With our tickets bought we started to wander back to the city center and came across a very proper and Victorian era designed building and found it was the National Art Museum that we had been told about at Publicity (the actual name of the organization that runs the Information office). We entered, payed the 2 USD fee with R40, and walked the creaking upstairs hallways. The best part of the gallery was a exhibit that had artists’ take on Ndebele traditional sayings. Some were quite odd, like the characteristics of cattle and how it relates to their personality, others were very similar to other cultures’ morals (don’t cry wolf, don’t be big headed, mother’s love for their children, etc). The rest of the Museum was very bland, with the only other highlight was an entire room of presenting a local’s artists three dimensional art pieces displaying some facet of Zimbabwean life, with a slight focus on the new constitution that is supposedly in the works. We finished and walked to the cafe that Publicity mentioned would be there, and sat down in the court yard, but were quickly ushered inside once an older gentlemen came out to tell us there WAS an inside. It was a small gallery with many laptops open and white professionals sipping tea, as the day had become overcast and quite chilly. We killed some time there picking at our overly decadent cake (yes too much for me even), and trying to stay warm. Their prices were surprisingly listed in Rands, and we asked about how to get money out of the ATMs. We had encountered a working ATM, but it did not accept my Mastercard Debit Card. One of the patrons of the shop was apparently the guru on the issue, and told us that Mastercard was rarely accepted, and on top of that the city banks were out of money. We then headed out to find a cab to the mall that Lonely Planet mentioned. I had hoped we would find an internet cafe, or a Telecom shop where we would purchase a 3G sim card. We payed R50 to be taken out there, even though our driver requested dollars, after hearing about the shortage of $$ we decided to pay the 10 to 1 exchange rate that everyone in Zimbabwe used for Rands to Dollars in order to conserve our USD. Arriving at the ‘mall’, a dreary place with a few shops that hardly looked open, and there were certainly not many patrons in the parking lot, I immediately regretted coming out here, and though we wandered (for about 2 minutes) around the entire structure we found nothing but an internet cafe and a supermarket that were of any note. I sent Alisa to the internet cafe as she was growing tired and weary as I wanted to walk the supermarket and see what could be had in Zimbabwe’s Second City. Noting the Amarula as I first walked in, the shelves were lacking the color of an American or South African Safeway or Pick n Pay. There were the basics and some luxury items that made it seem that one could get most of what one needed to life without having to go to South Africa for shopping every weekend. Most of the patrons inside were white, but it was hardly bustling, though it was the middle of the day on a Thursday. Alisa found me to tell me that there were no open computers at the internet cafe and I decided rather than having to summon a taxi to come fetch us (as this was obviously not popular enough to have its own taxi rank), we would walk back into town. Alisa wasn’t enthused with that idea, but I thought it better than to throw even more money away on this misguided adventure out of town. As we walked back from Ascot Shopping Centre along Leopold Takawira Ave (A6) we saw many school children as classes were dismissed for the afternoon. About halfway back to down we came across the Natural History Museum. Still having 2+ hours to kill before we needed to be back to Publicity to pick up our bags before they closed (1630), I convinced Alisa to go into one more Natural History Museum with me, even though we have only been to one (Maputo) this entire trip! I began to doubt my own enthusiasm after paying the 20USD for the two of us and just seeing more stuffed animals and horns as we walked through the Museum. However, upstairs we were rewarded for our (my) curiosity by a treasure drove of artifacts from the late 1800s and early 1900s when Cecil Rhodes was establishing his British South Africa Company as the de facto government of what became Rhodesia. The amount of Rhodes’ artifacts were astonishing, considering many would be coveted by any exhibition on colonial era Southern Africa, yet here they were in a museum in a failed state, viewed on that day by only two white Americans. Stuff like the death mask that Cecil Rhodes wore on his face as he was transported from Cape Town upon his death all the way to Bulawayo (the name meaning “place of slaughter” stemming from the 1800s when a rivalry erupted between the Ndebele of the region) where he had his body buried at World’s View, just south of Bulawayo (I had forgotten this piece of history, but now I would come back to Bulawayo just to be able to see the resting place that the richest man in the world at the time chose for himself and his best friends, as a name with World’s View makes it seem a place worth checking out). In this part of the exhibition there was much on the inhabitants of Matabeleland and Great Zimbabwe. I’m always interested to read what is written in museums originally managed by white South Africans or Rhodesians and see what changes, if any, have been made to history since the advent of multi-racial elections. Notably many captions on pictures around the turn of the century mention civil disturbances, which has lately been referred to as the First Chimurenga, a Shona word for “revolutionary struggle” (the Second was the fight conducted by ZANU and ZAPU against Ian Smith’s minority-run government in the 1960s and 1970s). Other than changing Rhodesia to Zimbabwe in the exhibitions (though professionally done with the same font, etc), there did not seem to be a major overhaul of history, or the telling of it at the museum. Finally, Alisa was able to drag me away (she had breezed through the entire section, and waited 15-20 minutes for me to catch up), we walked down into the circular centre of the museum, where we saw another exhibition. This one containing the Ark of the Covenant. This immediately triggered a recollection of hearing about what is believed by many to be the remains of the Ark was in a Southern African museum. There have been studies of the people, the Remba, with whom the Ark has resided with for the past millennium or so, and there have been genetic ties between the religious sect of these local people (who are neither Ndebele or Shona, the two major ethnic groups) and those of Jewish people around the world. Their oral history also presents strong clues that they came from the Arabian peninsula and that upon destruction of the Ark when arriving at Great Zimbabwe (c. 1100), the remaining pieces were used to create a new ark, one that looks like a massive wooden bowl. From the evidence presented, and from what I remember reading about this finding, this certainly seems to be the most conclusive artifact in the world that could contain remnants of the Ark of the Covenant. If this being the case, I sort of expected the trumpets of heaven and a light from above to descend upon the casing of the Ark as I approached it, or at least some Indian Jones music, or at the very least some goosebumps or a physical reaction of some sorts to being this close to such an important piece of world and Judeo-Christian biblical history, but this did no occur. At least Alisa was mildly impressed. A farmer goes to a bank in the city to collect the necessary funds to pay his wage laborers on his farm. Even though he has just a handful of workers, he takes a wheelbarrow to the bank in order to carry all the bills back to his farm. Upon filling the wheelbarrow he proceeds out of the bank, where he is mugged. His muggers leave all the cash and instead steal the wheelbarrow. We inquire about dinner options and she provides a list of options, but then offers to call ahead to a local Sports Club to see if they have the TVs on and whether there are people there, and she suggests we eat there as it’s a popular place with the younger crowd. We venture out, and Alisa is not inspired to take a cab out to the Sports Club, and instead wants to walk down the street to find Bou Jouree, another place Publicity recommended. However, we finally find it after searching all four corners it could be on, but they do not open until 1800. At this point Alisa is tired and hungary and I also want to eat before we board our overnight train to Victoria Falls. After Alisa falls in a large hole on the sidewalk because of the weight of her backpack, she is in no mood to just wander around to find other places, so we decide to end up heading to the Sports Club. We eventually find a taxi sitting in a parking space near a large hotel, and stand there for 5 minutes until the driver finally comes (very unusual, as they are usually propositioning you for a ride as soon as you come close to their vehicle). Arriving at the Bulawayo Athletic Club, we walk into to find a very modern bar, with high tables and chairs set up about a room that had a massive wood fire, and also 4 flat screen TVs adorning its walls. Alisa gets a Savanna Dry (her drink of choice for the majority of the trip), and I finally am able to get Amarula. There are many girls (white and black, but majority white) outside playing field hockey while a mixed race pick up soccer match takes places right beside the field hockey field. The patrons are clearly either white, or upper class black and we observe the comings and goings and the sports taking place out on the pitch from our vantage point in the adjacent bar. We eventually order, after staring at the limited menu with USD prices that would rival any bar/club in the US and end up paying 9 USD for a steak role (which actually turned out to be quite delicious) and 1 USD for a bottle of water, and 2 USD for the shot of Amarula. Paying in dollars was a odd thing for us, especially as we have come to view our small supply as a valued commodity that we do not give up easily after learning from our trip to Malawi in 2007 that you always pay in Rands or the local currency if possible to save the USD for the sticky situations (or border crossing that “don’t accept foreign currency” yet take USD….. this being a country in between Zimbabwe and Malawi that didn’t accept the Kwacha we had from Malawi and was all that we had left in our wallets). We asked our waitress if they could call a cab for us as we needed to head to the train station. She went and had a conversation with one of the other ladies at the bar, and came back to tell us that the owner (who had stopped by to check on us), had left and he was the one who usually placed the call as they had no landline. I tried to give an incredulous look, as what kind of bar anywhere in the world doesn’t have the ability to call for a taxi. So I told her we had no phones, and no sims, and had to get to the train station tonight and to see what our other options were. After a few minutes she returns and tells me I must give her money to go buy airtime for another woman who will call for a cab. It seemed a bit of a scam for me to have to pay 2USD to buy airtime for a call that certainly wouldn’t cost more than a view cents, but conveniently the 2 USD was the lowest amount of airtime one could purchase. With no other option, we agreed, and soon we were told that a taxi would be for us shortly. We get to the train station in less than 5 minutes as there is hardly anyone on the roads, and hardly a soul walking the streets (this at just after 6pm). We saddle up all of our stuff once at the station, which isn’t bustling but does have a good number of people mulling around, as well as a packed cafe inside the station. We are forced to walk all the way around the station after we are told the doors to the platform are closed, and they conveniently forget to inform the little group that had formed that we could simply walk through the cafe. Once on the platform we go in search of our train, not realizing that there was more than one platform at the station. After walking up number 1 and finding a cargo train we eventually wandered into the First/Second Class lounge and inquired among the people there if they knew what platform the train for Victoria Falls leaves from. We were told number 4 and make the long walk around to that platform and do indeed find passenger cars and then a car with a number matching our tickets. We board, and are immediately in a pitch black corridor and ask the man, who doesn’t look as if he belongs there where the switch is for the lights, thinking we were first onboard. He then gives the cheery reply that the lights don’t work. Thus we walk down the corridor and find our compartment, with a dark silhouette sitting on the first bench. I apologize, feigning confusion as if this is not my compartment, but he says it’s ok as he’s “just sitting here”, which he repeats twice and then gets up to leave and I thank him. We pile all of our stuff in and then take time to weigh up our new sleeping arrangements. There are three bunks on the right side of the compartment. The middle one is folded up so that the bottom can be used as a bench. Like the rest of the car, there is no electricity, the lock doesn’t work, but there is a chain lock, the top bunk is just 1.5 feet from the ceiling and there is a fold out table on the wall opposite the bunks. We settle in, bring out Alisa’s head lamp and my maglite and crunch away on Woolworth’s sour gummies that we brought along as we wait for people to board and for us to leave the station. We left just shortly after 7, so timing wasn’t precise, but better than what I expected. We heard American voices to the rear of our compartment and Spanish to the front, so we were heartened that we would not be the only foreigners on the train tonight. However, as we were pulling out, we realized we hadn’t asked anyone whether this was the Victoria Falls train, and we figured we’d learn our fate when the conductor came for tickets. He did so after we had changed for bed and gotten inside our sleeping bags (the compartment wasn’t as cold as the outside evening air, but it certainly didn’t trap our heat either). He originally tried to open the door, but Alisa has used our bungee cords that we brought to create a second layer of defense on the door. Alisa handed him our tickets and he looked and then handed them back wishing us a goodnight. So in the end we have made it on the right train and come morning we will be in Victoria Falls!